If Sola Scriptura is unclear what will come through the gate? The Apostles Creed drew the first line based upon Scripture which summarized the beliefs which must be held to be called a Christian. At Nicea the line was drawn to further clarify who was a Christian and who was not in dealing with the Deity of Christ: Jesus is both equally God and Man. In the days of Athanasius the line was dug even deeper: Jesus is God and Man, co equal, co-eternal, Very God of Very God. At the Council of Orange that line was placed in permanent ink: This is what you must believe to be a Christian. In today’s religious world, filled with a mix of enthusiast prophets and their false visions alongside the pseudo-calvinist who prefers to pick and choose what to believe at the schmorgasboard called evangelicalism, there is no longer any line. Gandolf said it best: This far and no farther. How far do those who hold to orthodox Christianity remain silent as the enemy routes the camp and pillages the faithful of their assurance and faith? How long do we permit the blurring of lines? When the reformation occurred the Lutherans, Dutch, Swiss, French, Hungarian, British and Irish Reformers drew the line in the sand again: This must be believed in order to be a true Christian. Somewhere the guards began to fall asleep. They began to permit those with a history of visions and dreams to help “inspire” them onto a deeper walk with Christ. Slowly the mystical practices of the Romanists like Madam Guyon and Brother Lawrence were taught as ways to holiness and perfection. Then came the decisionalists and their free will which eventually led to a God of their own making who didn’t know the future and was subjected to His creatures. These lines which had marked out the true Church from the false began to be erased. The people clamored for popular preachers and teachers, kings of their own instead of The King of kings. They cried for their stew just like Esau and sold their birthright. However, some of the old guard stood firm and fast refusing entry into the cities of refuge, the Confessionally reformed churches. So, the deceiver switched tactics. No longer wishing to erase the lines, which always alerted the faithful to defend the walls, they decided to blur them. Why not take on some of the language of the citizens and dress up like them in their books and on their videos. Why not look like them, talk like them, worship in a similar manner with a little more excitement added in. So they took the name of the most famous reformer and clothed themselves in sovereign election, irresistible grace and perseverance and declared themselves citizens of the king but from a far off country. Disarmed the citizens let them in the front gate welcoming them as brothers and sisters of the Reformation but from some long-lost family line. The deception had blurred the lines and they were in. Over the next few years they spent their time teaching their form of Christianity and placed the Scriptures, formerly the only rule of faith and life, aside for some personal visions and dreams and messages from the King that they could hear in their hearts, for who can judge what is in your heart? After all, only God knows what is there. Slowly, the Book which had guided the citizens of the city of refuge was put away for a more contemplative way of the master. As the pseudo-citizens offered morsels sweet to the taste, some citizens were deceived and ate, forsaking their teachers from the past such as the Heidelberg and Westminster Catechisms. But soon, that which was sweet became bitter. Something was wrong but because they no longer looked to that old dusty book they simply asked for more morsels hoping the sweetness would assuage that bitterness. Then the time came for these foreigners, now called fellow citizens to exact the fullness of their plan. They began to bring in their pets. But they were not pets they were timber wolves who teeth were set to destroy. They were wolves looking to devour even the elect in the city and tear their assurance to shreds, their teeth sharpened to sink into any defender against them. But God had not left these citizens. Knowing the attacks would come, there were those who had once lived in the cities outside of the reformed and had been converted, granted citizenship in the City of Light, who were aware of the tactics of the enemy and would know from a single bark whether it was simply a pet or a timber wolf. As the Pseudo-calvinists began to bring in their pets, the Ex-Outsiders recognized the sound, the taste and the smell of that which would attempt to slaughter the citizens. They warned, they fought, they pleaded. No longer would the lines be blurred. The citizens would be awakened again, their eyes opened to the danger, and the lines redrawn along the ancient paths. God would not have His Bride slaughtered or destroyed. He had promised the very gates of Hell would not prevail and would protect and preserve Her throughout all the ages. Time to dig in and draw the line to the ancient path of God’s Word truly being the sole, unique, and only revelation of His will for our lives. It is time, brothers and sisters, to once again clarify what we believe and where that line is. Time to stand up and say, while defending the line: This far and no farther. I pray, God grant His children the strength and grace to hold the line and that He will give sight to those He wills. His children may take solace that He will send faithful guards who will hold the line and not blur it for His children. 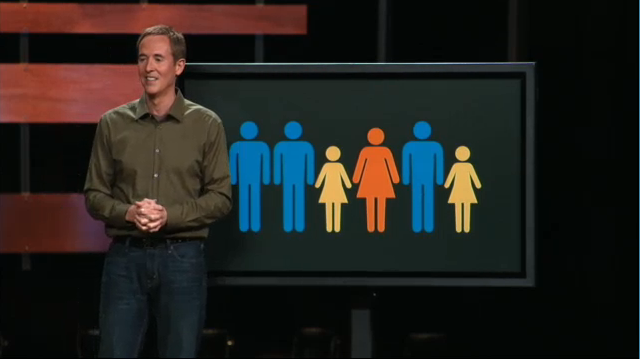 I am sure by now if you follow the blogosphere at all with regard to evangelicalism, you are aware of the controversy surrounding Andy Stanley, pastor of Atlanta’s North Point Community Church. Plenty has already been said and plenty more I am sure is coming. Al Mohler’s article was the first that I read and after viewing the sermon in question (see the 24:30 mark of sermon 5 Titled: When Gracie Met Truthie), I have to say, I really can’t believe there is any backlash from the Christian community against Al Mohler’s article? Have we really reached the state in the American evangelical world when asking questions and raising concerns over the interpretations of Scripture by a pastor of Mr. Stanley’s influence and notoriety is the most egregious of all sin? Well, that is just absurd and contrary to the Scriptures. Did not John the Baptist call for the leader of the Jewish Kingdom to repent of his open and flagrant sin? Did not John the baptist call for all those wishing to become part of the Kingdom of God to show forth fruits of repentance? Is there absolutely no need to be repentant of sin any more and still be considered a Christian? Surely, this is a sign of these last days in which we live. Okay, so the big argument is, well aren’t we suppose to welcome everyone to the church? Aren’t we suppose to invite sinners to the church to hear the gospel? The answer? Yes, of course! Is that all that is demonstrated in this story? No! First of all, what Mr. Stanley is preaching is NOT THE GOSPEL but is rather a message of liberalism that says Jesus died to pay for your sin so you could continue in it. Where is THAT in the Scriptures? Where is repentance in this message? The woman caught in adultery? Jesus calls her to be repentant. Repentance is an evidence that we have been born again. “If your brother sins against you, go and tell him his fault, between you and him alone. If he listens to you, you have gained your brother. But if he does not listen, take one or two others along with you, that every charge may be established by the evidence of two or three witnesses. If he refuses to listen to them, tell it to the church. And if he refuses to listen even to the church, let him be to you as a Gentile and a tax collector. (Matthew 18:15-17 ESV). And in Corinthians Paul CLEARLY and UNAMBIGUOUSLY gives us instructions that we are in fact to judge and admonish and even cast out any “so-called” brother refusing to turn from a lifestyle of open and rebellious sin. The whole of Scripture is pointing to the fact that God’s perfect law can not be fulfilled in a way to bring about our salvation and righteousness, except that we receive grace through faith the perfect righteousness of another: our Messiah Jesus Christ. However, having received this righteousness, as Paul asks, are we now to sin all the more so that grace may abound more? God Forbid it! What shall we say then? Are we to continue in sin that grace may abound? By no means! How can we who died to sin still live in it? Do you not know that all of us who have been baptized into Christ Jesus were baptized into his death? We were buried therefore with him by baptism into death, in order that, just as Christ was raised from the dead by the glory of the Father, we too might walk in newness of life. For if we have been united with him in a death like his, we shall certainly be united with him in a resurrection like his. We know that our old self was crucified with him in order that the body of sin might be brought to nothing, so that we would no longer be enslaved to sin. For one who has died has been set free from sin. Now if we have died with Christ, we believe that we will also live with him. We know that Christ, being raised from the dead, will never die again; death no longer has dominion over him. For the death he died he died to sin, once for all, but the life he lives he lives to God. As I see it, Mr. Stanley has shown his hand at this point. And the rest to be continued this summer….stay tuned. And her other links are here and here and here and here. She has not completed the series and plans for it to be a summer project. So I will keep you posted. You know what…I’m going to do another post with all her links and titles, but at least for now this gets you started. I have written much about Richard Foster and Contemplative prayer as that was my primary exposure to this topic and to Spiritual Formaiton. However, Dallas Willard, a ministers in the SBC has had as much influence on the modern evangelical departure for Biblical Christianity as Foster has had. I ran across a sister writing on Foster and asked her permission to share an excerpt of her article here and then direct you to further read her commentary on Dallas Willard’s, The Divine Conspiracy. Below is the first installment and I encourage you to follow the links to the rest of her review. So Okay, I’m going to read it. Considering the size of this particular volume by Willard, it seemed best to record my thoughts in installments. I’ve already read the introduction and already have more to say than I dare put in one post. For the sake of my readers, I will try to be relatively brief, but the introduction is full of his thesis for the entire book, so it is probably the most important “chapter” to examine closely. Dr. Willard begins by lamenting the shallowness of the Church in America. He complains that the Church as a whole doesn’t seem to be taking Jesus seriously in regards to his command to “make disciples of all nations” and “teach them all I have commanded.” I actually agree with Willard on this point I suppose, and judging from the rest of the introduction, this could possibly be our only point of common ground. But I agree that the average person who confesses Christ has little root to his faith and has been indoctrinated by the World far more than by the Christian faith. But as Willard expands on what he sees as problematic in the Church, we begin to part ways as Dr. Willard departs constantly from God’s Word as the basis for his analysis and his solution. Under the section of his introduction called “My Assumptions about the Bible”, Willard begins by describing what most theologians would call the “perspicuity of scripture”. Perspicuity is the state of being transparently clear and easily understandable. What is ironic is that the passage where he describes this belief is not, in itself, perspicuous. I found myself giggling at the irony. In the section describing Scripture’s clarity and how it was written for the common man, Willard’s verbiage and logic took a serpentine route across two or three pages, taking several paragraphs to say what I could have said in one very short paragraph. It quickly became clear to me why this book was so long. Jesus himself was thought of as someone to admire and respect, someone you thought highly of and considered to be a person of great ability. Worship of him included this – not, as today, ruled it out. What does this sentence mean? I think I read it three or four times and was still scratching my head. It seems that perhaps his particular definitions for the descriptive phrases “thought highly of” and “person of great ability”, are much different than what might be their most forthright interpretation, using the basic dictionary definitions of the words they contain. But despite the mental hurdles thrown in my path, several messages came through quite clearly from between the lines. For instance, I found significant meaning from one little phrase in the aforementioned quote. Willard uses the phrase “not as today… “. What is Professor Willard saying when he says “not as today”? These three words expose the heart of Willard’s teaching and his attitudes towards what most would consider orthodox Christianity. He constantly implies that we need to go all the way back to the first century to find proper discipleship and worship of Jesus. He did not follow this phrase with any qualifier, such as “in liberal churches” or “in most mainstream denominations”. He gave no qualifier to imply that, at this point in history, there was anyone out there “getting it right”. The early message [of Jesus] was, accordingly, not experienced as something its hearers had to believe or do because otherwise something bad – something with no essential connection with real life – would happen to them. Let me first state that there is enough in Richard Foster’s teaching on contemplative prayer to rightly assert his teachings are false and against the Word of God so as I continue to write additional reasons for why I reject him as a legitimate teacher of biblical truths, understand that these are just additional red flags in his teaching that support the assertion that he is a false teacher. In this post I wish to make a case that his endorsement of spiritual direction and spiritual directors is directly contrary to the Scriptures which teach us that Christ is our only mediator. Now, let’s examine what exactly spiritual direction is and why it violates this principle of Christ being our mediator and high priest. According to Renovare’s definition of Spiritual Direction, (I posted the entire definition as found here on Renovare’s site because I think it is important for you to get a real sense of just what it is that Spiritual Direction claims). “Spiritual direction provides an “address” on the house of your life so that you can be “addressed” by God in prayer. When this happens, your life begins to be transformed in ways you hadn’t planned or counted on, for God works in wonderful and surprising ways. While the phrase “spiritual direction” may sound a bit lofty, it is simply a relationship through which one person assists another in attending to the presence and call of God in all of life. Though not always called by this name, spiritual direction has been a vital ministry in many streams of the Church for hundreds of years. Spiritual direction is for anyone yearning for God. Sometimes this desire appears as a sense of longing for something greater or a sense of discontent with the status quo. For others this pining is more focused, rising from a clear understanding that a sense of God’s presence is missing from particular parts of life. Of course, an underlying assumption and basis for spiritual direction is that God—Father, Son, and Holy Spirit—is actively drawing us into the Eternal Presence. God is the one, true “director,” working constantly, actively, powerfully in the very midst of our ordinary, everyday routines and life circumstances. A spiritual direction relationship is one way to help us pay attention to this Divine work. It interrupts our typical routine long enough to help us notice God’s wooing of us and become more deeply aware of God’s presence with us.The spiritual direction relationship includes a director and directee, with the director often being called a “spiritual director.” While different directors have different approaches to their practice, typically she takes an active/passive role, simply creating the environment for the direction to take place. The director intentions to do more listening than talking, asking leading and, sometimes, probing questions as needed and appropriate. Times of silence are apropos and welcomed. There is very little actual direction given as this is commonly understood. Rather, the spiritual director convenes a conversation during which a direction will be determined by the directee and director together, co-laboring with God. Both directee and director explore together what God might be doing in the areas being discussed. While the lines may be blurry at times depending on the style of the spiritual director or present circumstances, spiritual direction is different from pastoral counseling. People usually enter a counseling relationship because something is wrong with life. Counseling tends to be crisis-oriented or problem-driven. Solving particular problems or handling specific crises is not the goal of spiritual direction. The spiritual direction relationship takes the long view. It looks for how God is working, calling, prodding, and inviting us to new ways of being with Jesus in the midst of our circumstances. It focuses on building an intimate relationship with God over a lifetime, through all the problems, crises, joys, and blessings. What else is that but a description of a man or woman attempting to act as the Holy Spirit in another’s life? Notice it does not say that they come alongside and help you with Biblical understanding or counseling. There is no indication that they are there to help you understand and learn what God has already said in his revealed and closed cannon of Scripture with regard to His will for your life. It is very clear that their purpose is to guide you into some sort of mystical prayer experience and to somehow interpret for you what it is that God is doing and saying in your life. I think the most blasphemous assertion is that this person is “co-laboring with God” to help in the direction of your soul as well as the assertion that “Spiritual Direction is for anyone yearning for God”. Notice again, there is no mention of the necessity for this “anyone” to be a regenerated believer in Jesus Christ, no need for being born again, sealed with the Spirit, or regenerated in order to enter into the presence of God. Again, I stand by my previous articles when I say that Foster does not believe it is necessary for a person to be born by the Spirit into the Kingdom of God, rather he endorses a works based philosophy whereby anyone can enter into a relationship with God via the many extra biblical means that he promotes. D.A. Carson has written an excellent article explaining some real concnerns with the confusing terminology that is “Spiritual Disciplines”. I highly recommend you give it a read as it really hits on a lot of the concerns I have been writing about with regard to Richard Foster. Gary Gilley of Southern View Chapel is spending the entire year of 2012 reviewing the Spiritual Formation movement. I strongly encourage everyone to read his articles as well as several great book reviews of those involved in this movement. He has recently reviewed contemplative prayer. I also recommend his article on the wildly popular Ann VosKamp book, One Thousand Gifts. The Justice Conference: Another Ecumenical Emergent Event? I received a request from a reader to take a look at The Justice Conference 2012 being held in Portland, Oregon this weekend. The reader had some concerns regarding the conference and wanted me to give my opinion. Rather than offer just an opinion, as I am certainly no expert, and for that matter man’s opinions are of little real value,let’s instead view the facts with regard to the conference and a few of the numerous speakers. Then as the Bereans were commended by Paul, let’s compare the teaching of these speakers with the sure truth of the Holy Word of God. As one who continues to observe the various movements occurring in today’s visible church and “evangelical” world (and I definitely use that term loosely in this regard), it is inevitable that trends can be seen in gatherings of this magnitude. Boasting over 60 speakers comprising the pre-conference and conference panel this is no small event. Justice is a garment, a billion threads, interwoven, interlocked, knit together with strength and integrity. Pull one thread from the fabric and the garment begins to fray. Pull ten million threads and justice unravels into injustice. The work of justice is to mend the holes injustice inflicts upon the garment. It is a brave, challenging, courageous work and it does not begin with expertise or duty. It begins with love… and love is a thread. The Justice Conference 2012 is the second annual international gathering of advocates, activists, artists, professors, professionals, prophets, pastors, students and stay-at-home moms working to restore the fabric of justice. For some it means speaking. For others it means singing. For some it means going. For others it means giving. For all, it means living with mercy and love. You are invited to come weave your voice and gifts into the conversation. Join us, and discover that in the garment of justice, your love is an irreplaceable thread. To be fair, nothing in that description boldly declares this is a gathering of “Christians” for the purpose of spreading the gospel so, perhaps, this is just a humanitarian gathering to help facilitate humanitarian efforts, but with the inclusion of the term “prophets and pastors” one does get the impression that there is an intention of representing Christianity in this gathering. Furthermore, when evaluating some of the speakers and their vocations and/or “ministries” clearly the participants see this event as one in which God is “speaking” into the issue of “social justice”. Francis Chan, author of books, Crazy Love and Forgotten God, and founding pastor of Cornerstone Church in Simi Valley, California, and is the founder of Eternity Bible College. Certainly based upon those represented here, one can only assume the “voice” or “god” being represented is that of the Holy Bible. So having made this conclusion, let’s look further at the doctrinal fruit, if you will, of some of these speakers, authors, and pastors. We are certainly told in Scripture to test every spirit that claims to represent God and the gospel. Now let’s examine the fruit of some of these and a few of the other listed speakers. So what does Mr. Brueggemann, the Old Testament scholar, think of the God of the Old Testament which, incidentally, IS THE SAME GOD of the New Testament? Walter Brueggemann, has stated that “God is a recovering practitioner of violence.” Wow, Mr. Brueggemann, so at what point did God recover from this “violence”? Was there a therapist to help Him work through that? Isn’t that akin to accusing God of having a flaw in His nature that required some form of improvement? Is Jesus a deity in the Muslim faith or just a good teacher? Are there multiple paths to the same god? Do other religions view Jesus as John describes Him? Dr. Christina Cummings – former abortion doctor and director of a Planned Parenthood clinic in Pasadena, CA.who now speaks about healthy eating and holistic medicine. Contact has been made to inquire as to whether she has had a conversion to Christianity and repented of her former life as an abortion doctor and director of Planned Parenthood clinic. We are still awaiting a response. Rev. Dr. Randy S. Woodley is Distinguished Associate Professor of Faith and Culture and Director of Intercultural and Indigenous Studies atGeorge Fox Seminary in Portland. He is an author, teacher, poet, activist, former pastor and missionary, missiologist and historian. Dr. Woodley is a Keetoowah Cherokee Indian, leading a local indigenous gathering at his home in Newberg, Or. Mr. Woodley speaks on his blog about his working relationship with Mr. Brian McLaren, Emergent Church Leader, and denier of the atonement of Jesus Christ and writes articles for the Emergent Church blog, The Emergent Voice. And lastly, but certainly not least or exhaustive with regard to the over 60 speakers of this “Justice” conference is a speaker of great interest and concern with regard to the true gospel of Christ, Mr. Shane Claiborne. In a conversation with emergent leader Tony Compolo, we see just exactly what Mr. Claiborne believes about the gospel of Jesus Christ and Muslims. SC: Both Muslims and Christians are very evangelical in the sense of desiring others to come to faith in their God. When we talk about inter-religious cooperation, does that mean that we need to stop trying to convert each other? I think that what we all have to do is leave judgment up to God. The Muslim community is very evangelistic, however what Muslims will not do is condemn Jews and Christians to Hell if in fact they do not accept Islam. What do the Scriptures say about salvation? In this issue of Esquire Magazine, Mr. Claiborne, apologized to unbelievers for the way in which believers in the past have misrepresented Jesus and Christianity. Mr. Claiborne, this could have been a good time to share the gospel, but since it is clear you feel that it’s not for us to judge or pronounce judgments on anyone or to obey the clear mandate of the great commission, for the sake of your friend, “I hope” he looked elsewhere for his answers. Let me remind my readers what Scriptures say about ALL MEN. It is not that we are pronouncing any judgments upon anyone, but rather clearly heralding the Word of God which states that NO MAN is good and that all are under condemnation apart from Christ. This is not the judgment of man; this IS the judgment of God. In closing, what is my opinion of The Justice Conference? Whatever the stated purpose of the conference is, the obvious implication remains that the ecumenical nature of this gathering is to, yet again, further blur the lines between true theological conviction based upon a solid Biblical understanding of the objective truth of the Holy Bible and the true gospel of Jesus Christ with the softer, mystical, subjective, and tolerant “new kind of Christianity” of the Emergent Church. Gary Gilley has recently written some articles dealing with the Social gospel movement that might also be of interest to you. Spiritual direction provides an “address” on the house of your life so that you can be “addressed” by God in prayer. When this happens, your life begins to be transformed in ways you hadn’t planned or counted on, for God works in wonderful and surprising ways. “Henri Nouwen was a spiritual thinker, a synthesist and one of the first in our time, along with Thomas Merton, to consciously develop a “theology of the heart” and to lay this down as a template for both clergy and lay persons. Henri had an unusual capacity to write about the life of Jesus and the love of God in ways that have inspired countless people to trust God more fully. He showed, and continues to show, a generation of ministers, teachers and seekers how one’s gifts are to be placed at the service of those whom God places in our path. He gives us a model for building the kinds of relationships and communities that will allow each person to find his or her personal mission. As Merton before him, Henri always stressed the relational. He writes very directly about our contemporary longings for meaning, belonging, and intimacy and, at the same time, integrates this with a powerful vision of service and social justice. Fr. Nouwen often used the three core themes of solitude, community, and compassion to help people enter into a fresh vision of the spiritual life. The first obvious question to be begged is, “Is this Biblical?” What Scriptural support is there that anyone needs to be a co-laborer with God to help another “explore what God might be doing” in the areas discussed? Certainly, seeking Godly counsel is spoken of in Scripture. Is that perhaps all this is? Is this simply seeking a counselor to aide in making wise and godly decisions in life? Well, let’s let Renovare answer that question. So Spiritual Direction is NOT pastoral counsel or Biblical guidance. Okay, what is it then? We know Henri Nouwen has told us it is putting an “address” on the house of our life. So, does this mean that God can’t find me if I don’t practice this discipline? Does this mean He needs the help of this “spiritual director” to “co-labor” with Him to assist Him in finding His children? Here we see a confession of repentance and a declaration by Christ that Salvation has come to the house of Zaccheaus since Zachaeus’ confession has revealed him to be a son of Abraham. We see Jesus declare that He came to seek and save the lost. Jesus didn’t need any help from a co-laborer to find the house of Zacheaus. Jesus doesn’t need a co-laborer today to find any of His children. Christ is the Sovereign God and Creator of the Universe, and His children hear His voice. He needs no help from anyone to find the “address” of His children. • Direction sessions are usually one hour in length, once per month and can be held anywhere conducive to intentional conversation—a quiet office, coffee house, or park bench. • The director may or may not give the directee a spiritual practice to work with between sessions. • There is a place for group spiritual direction, but the classical model and that in mind here is the one-to-one interaction between director and directee. • Many spiritual directors will discourage the relationship extending beyond the direction sessions so that they might remain objective and not get caught up in personal feelings and opinions. So clearly this is not a situation where Godly counsel and brotherly edification, encouragement, admonition, and prayer support is taking place. No! This is mediation; plain and simple! This is seeking a human being to act as a mediator between you and God. That, my friends, is strictly forbidden by Scripture! And why not? Why do we NEED a mediator when we have Jesus Christ, the great High priest? But you have come to Mount Zion and to the city of the living God, the heavenly Jerusalem, and to innumerable angels in festal gathering, 23 and to the assembly[a] of the firstborn who are enrolled in heaven, and to God, the judge of all, and to the spirits of the righteous made perfect, 24 and to Jesus, the mediator of a new covenant, and to the sprinkled blood that speaks a better word than the blood of Abel. John Calvin’s commentary on 1 Timothy 2:5 so clearly lays out the problem with Richard Foster’s and others’ endorsement of using some human “spiritual director” as a mediator between us and God. And, indeed, if this were deeply impressed on the hearts of all, that the Son of God holds out to us the hand of a brother, and that we are united to him by the fellowship of our nature, in order that, out of our low condition, he may raise us to heaven; who would not choose to keep by this straight road, instead of wandering in uncertain and stormy paths! Accordingly, whenever we ought to pray to God, if we call to remembrance that exalted and unapproachable majesty, that we may not be driven back by the dread of it, let us, at the same time, remember “the man Christ,” who gently invites us, and takes us, as it were, by the hand, in order that the Father, who had been the object of terror and alarm, may be reconciled by him and rendered friendly to us. This is the only key to open for us the gate of the heavenly kingdom, that we may appear in the presence of God with confidence. I think one of the fundamental issues with Foster as I continue to read his teachings and writings is he is so opposed to the total depravity of man, that he must contrive to use all manner of other methods to get to God rather than the simple gospel message of repent and believe. I’ve outlined this problem in his theological understanding here and here. there were, nevertheless, some persons skilled in deception, who thrust angels into his room as mediators; which is evident from Colossians 2:18. But what Satan, at that time, contrived secretly, he carried to such a pitch, during the times of Popery, that scarcely one person in a thousand acknowledged Christ, even in words, to be the Mediator. And while the name was buried, still more was the reality unknown. Now that God has raised up good and faithful teachers, who have labored to restore and bring to the remembrance of men what ought to have been one of the best-known principles of our faith, the sophists of the Church of Rome have resorted to every contrivance for darkening a point so clear. First, the name is so hateful to them, that, if any one mentions Christ as Mediator, without taking notice of the saints, he instantly falls under a suspicion of heresy. But, because they do not venture to reject altogether what Paul teaches in this passage, they evade it by a foolish exposition, that he is called “one Mediator,” not “the only Mediator.” As if the Apostle had mentioned God as one out of a vast multitude of gods; for the two clauses are closely connected, that “there is one God and one Mediator;” and therefore they who make Christ one out of many mediators must apply the same interpretation in speaking of God. Would they rise to such a height of impudence, if they were not impelled by blind rage to crush the glory of Christ? There are others who think themselves more acute, and who lay down this distinction, that Christ is the only Mediator of redemption, while they pronounce the saints to be mediators of intercession. But the folly of these interpreters is reproved by the scope of the passage, in which the Apostle speaks expressly about prayer. The Holy Spirit commands us to pray for all, because our only Mediator admits all to come to him; just as by his death he reconciled all to the Father. And yet they who thus, with daring sacrilege, strip Christ of his honor, wish to be regarded as Christians. “SEVERSON: At this spiritual retreat, they learn how different faith groups reach out to God, including the Muslim prayer of Salat, always facing Mecca five times a day. RAHMAN: An Islamic prayer is essentially about praising God and thanking God, and when we bow to God, the wonderful saying is: one prostration of prayer to God liberates you, frees you, from a thousand prostrations to your ego. SEVERSON: The Sufi’s whirling dervish, performed here by Reverend Karen Lindquist, the Interfaith Church’s co-founder, is also a mode of prayer, although it requires a life-long commitment. FALCON: One of the benefits of ritual is it gives us a form, for example, the ritual of prayer. But every ritual that we do in our lives also has us going on automatic. So there comes a time where I might be doing it outwardly, I might be saying the words, but I’m no longer conscious of them. SEVERSON: A common theme among spiritual directors is that first it’s necessary to value and love oneself as God’s creation. MARQUIS: So what I’ve been doing is using the Buddhist prayer to quiet me down, quiet my thoughts down and open myself up, and then the Sufi prayer to just reassure and love my own heart so that I can feel really full and complete, and then from that place I can pray for people that are struggling, people that are sick, people that I feel like need some extra love. SEVERSON: Even Sister Joyce Cox, in describing her method of personal or centered prayer, finds herself borrowing the language originally of the ancient Indian Vedic tradition. COX: What I do in centering prayer is I choose a mantra, which is my sacred word, doesn’t have to have any meaning for me. What I simply do is return to that sacred word as a method of intention and just sit. Brothers and sisters, we’ve no need of another mediator: dead or alive. We know that these men and women fumble around in the dark trying to discern the spiritual things because the natural man can not discern them, but this ought not be so of us who have been bought by the blood of Christ and given every spiritual blessing. I pray that my brothers and sisters will consider the gravity with which you ought to take your responsibility to study and know the Word of God in this dark age of falling away and apostasy. Be on guard and verify EVERY THING that you are being told is from God. Test ALL THE SPIRITS. Do not believe because someone can point to a so-called “rich tradition” of prayer or practice, that it is a “tradition” that is grounded in the Word of God. Be warned and turn from the evils of contemplative prayer, lectio divina, and spiritual formation. Do not be dragged back to Rome, but study to show yourselves approved dear ones. As I began to prepare my final entry on Richard J. Foster, Living Spiritual Guru, Quaker, and founder of Renovare’, a “nonprofit Christian organization headquartered in Englewood, Colorado, and active worldwide. We seek to resource, fuel, model, and advocate more intentional living and spiritual formation among Christians and those wanting a deeper connection with God.“ (begs the question who is the “and those” that can have a deeper connection with God besides Christians), I found myself feeling the need to add a follow up post to Why I Believe Richard Foster Is A False Teacher: Reason 2: Denies Total Depravity and Salvation By Grace Alone. In Why I Believe Richard Foster Is A False Teacher: Reason 1: Centering Contemplative Prayer , we discussed the dangerous practice of contemplative prayer and it’s unbiblical eastern mystical roots. We also covered in greater detail the dangers of Contemplative prayer in, Are You Bowing To The Golden Calf of Mysticism? If you still need further evidence that the end result of contemplative prayer is a satanic one, watch Fr. Thomas Keating tell us in the following video that the final destination of contemplative prayer is, “that we not only become God, but are God”. A quick search for the name, Thomas Keating, on Renovare’s ministry page yields this plethora of recommendations to look to Thomas Keating as a resource for contemplative prayer. Nothing could be farther from the truth? Does the Scripture say nothing of the wrath of God against the sinfulness of man? This is basic fundamental Christianity 101. No, Mr. Foster, I am afraid that it is your words that couldn’t be farther from the truth! Salvation is BY GRACE ALONE through FAITH ALONE to the GLORY OF GOD ALONE! There is nothing in Scripture either from Christ or the apostles that instructs us in any way shape or form to practice such forms of so-called ‘prayer’. Nothing Folks! There is nothing classically “Christian” about this man’s instruction. Listen carefully in as Richard Foster says, “This Zoe (life) is built into the very DNA of who we are as beings created in the image of God it is an inward principle and it will do it’s work” he goes on to say, “there is also a principle of death within us that stems from the fall and it is warring against the principle of life”. The Bible tells us as a result of the fall, we have all received complete spiritual death. There is no zoe life in our DNA spiritually speaking UNLESS the Spirit of God by grace through faith regenerates us; thereby making us a new creature in Christ. To Foster, it seems, salvation is always an ongoing process that is a cooperative effort between us and God. There is no one justification by faith. There is a definite blurring of justification and sanctification, and he can re-label it all he wants, but what he advocates is a justification by works. Be on guard church.